Crushed limestone is an angular rock, typically produced by mining and crushing suitable rock deposits into desired sizes. ​It is one of the most accessible natural resources and a major basic raw material used by construction, agriculture and other industries. It differs from gravel in that the latter has round edges and is formed through natural weatherization and erosion. ​We supply and deliver crushed limestone rock produced from premier quarries throughout Texas, Oklahoma and Arkansas. Mixed In Concrete – Concrete is a combination of cement, water, sand and crushed aggregate. 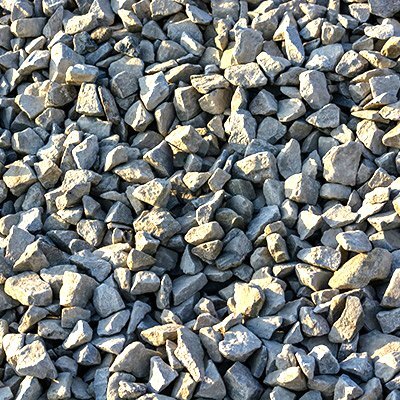 In some cases, crushed limestone will be used as the aggregate material to create a more durable concrete product. Road Base – Roads and highways require a durable base that will safely withstand the high traffic and earth’s harsh elements. Crushed limestone is an affordable, reliable road base option for many contractors. Pipe Bedding – Pulverized limestone rock does not expand and contract, making it a safe and reliable option for bedding underground pipes. It’s material consistency preserves and insulates pipes from natural shifts in the earth’s soil as a result of moisture, surface traffic or other natural soil patterns. Structural Fill – In new construction, crushed stone is used to fill the area beneath the slab. This keeps the concrete level, allows for proper and efficient drainage and reduces settlement cracks. Driveways – Some homeowners like the idea of a gravel driveway, but would prefer to have other color options. Crushed lime is able to offer all of the benefits of gravel, but provides a soothing, natural tan coloration. Railroad Ballast – Railroad ballasts support the rail ties and diverts water away from the tracks. This material is chosen to offer angular support and durability. Rip Rap – Crushed limestone is affordable, convenient, and reliable, making it an alternative to rip rap in the use of retaining walls and erosion control.